Sign up today to join our mailing list. As a thank you for joining, we will email you the link to our exercise videos now available online. 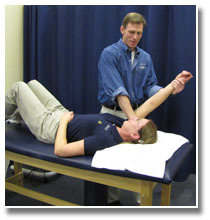 Upper Perk Physical Therapy & Sports Rehab respects your privacy. We will never share this information with any third party nor will we barrage you with emails. We will occasionally send you information and news and alert you to new special offers and discounts. There is absolutely no obligation, so sign up today!